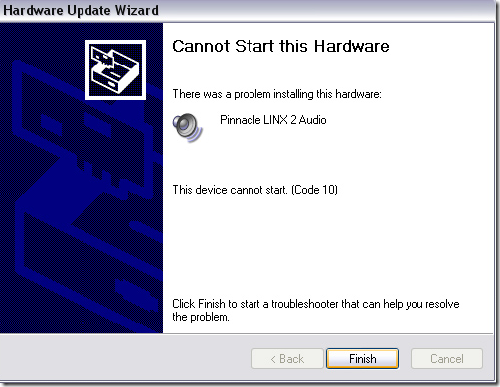 SOLUTION FOR High Definition Audio Device - Device Cannot Start (Code 10 error in HP Laptop ) is available here. Important These steps are for advanced users, such as IT Professionals, who are comfortable with editing Registry entries. Follow the steps in this section carefully. Serious problems might occur if you modify the registry incorrectly. Before you modify it, back up the registry for restoration in case problems occur. You may also want to create a Restore Point. These steps are not necessary if you’ve run one of the troubleshooters above, as the troubleshooter performs these. This problem may be caused by two Windows registry entries that have become corrupted. To use this method, you must be logged on to Windows as an administrator. Type regedit in the Run dialog box, then press Enter. If you are prompted for an administrator password or for a confirmation, type the password, or click Allow. Note: Each 32-digit subkey is unique and corresponds to a particular type, or class, of hardware in Device Manager. Find the correct class GUID corresponding to the type of the hardware device that you're seeing the Device Manager error code for. System	4D36E97D-E325-11CE-BFC1-08002BE10318	System buses, bridges, etc. Note: This is not a complete list of device class GUIDs. Several less common system defined device classes do not exist. Devices can generate unique classes based on various variables, that makes it impossible to list them all. For example, if your DVD drive is showing a Code 10 error in Device Manager. According to the list above, the GUID for CD/DVD devices is 4D36E965-E325-11CE-BFC1-08002BE10318. When you know this GUID, you can continue to the next step. Click the registry subkey corresponding to the device's Class GUID that you determined in the last step. If you do not see the UpperFilters registry entry, you still might have to remove the LowerFilters registry entry. To do this, go to step 9. Note: If you do not see the LowerFilters or UpperFilters registry entry, this method is not for you.